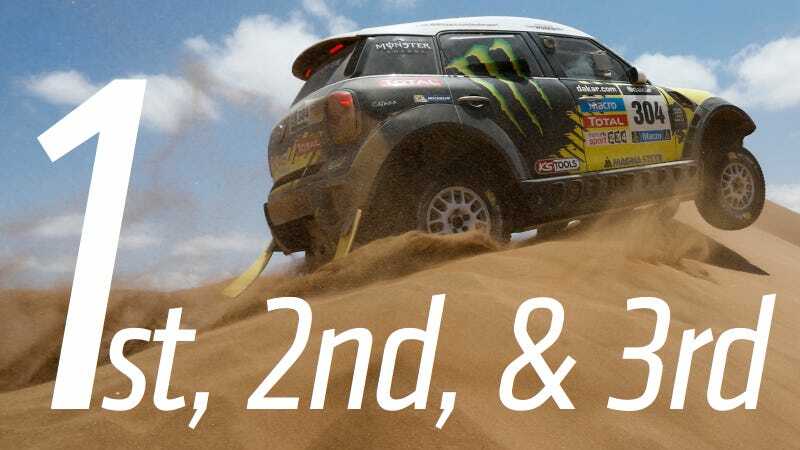 Spanish Driver Nani Roma and French Co-Driver Michel Perin have won the 2014 Dakar Rally cars category in a MINI ALL4 for Team X-Raid. Their total time was 050:44:58. Just over five minutes behind them was MINI teammate Stephane Peterhansel in second, followed by yet another MINI ALL4 driven by Nasser Al-Attiyah. "I don't know if this was the most stressful thing I'd ever done, but it was very tough. The second week, with difficult, long stages, wasn't easy. We're happy, very happy with the work Michel [Périn] and I did. I'm going to revel in this. 10 years to the day after winning on a motorcycle, I've won in a car. It's a dream come true. My former co-driver Henri Magne and his wife Lucette are in my thoughts. This victory is for Henri..."
In trucks, the Kamaz was declared victorious after close examination of hindrances in the last stage.